The Argentine military is searching for a submarine that had forty-four people on board. The submarine has been missing for three days. 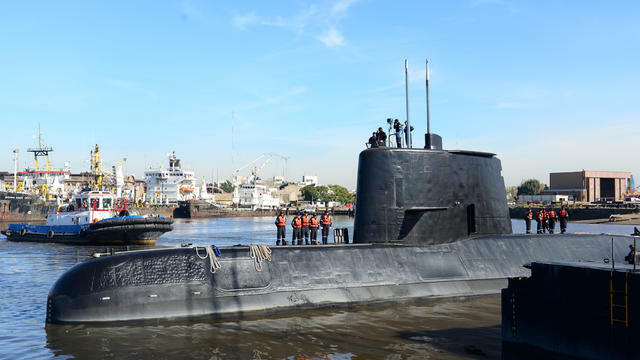 The submarine is part of the Argentine Navy. The last contact that the Navy had with the submarine was around two hundred and sixty miles off the coast of Patagonia. The submarine is being searched for in a rather common way. The search for it contained aircrafts and boats but the weather has been a complication since high winds and waves have made it harder to spot to submarine. The operation had been turned into a search and rescue operation late Friday night when no communication and no radar detection with the vessel had been made. Naval spokesman Enrique Balbi said: "We expect that it is on the surface,"
"Obviously, the number of hours that have passed — two days in which there has been no communication — is of note." He continued. The Navy is said to believe the submarine lost contact due to a possible electrical outage. The submarine lost contact when it was supposed to be en route to Mar del Plata, which is a coastal city. Argentina also accepted an offer from the United States to have a NASA P-3 explorer fly over the search region. It was currently stationed in Ushuaia and was supposed to depart for Antarctica. The President of Argentina, Mauricio Macri wrote on the social media platform known as Twitter "We are committed to using all national and international resources necessary to find the ARA San Juan submarine as soon as possible."